Why Choose A Pickup Truck Over An Average Car? Pickup trucks are one of the most popular vehicles on the American road. 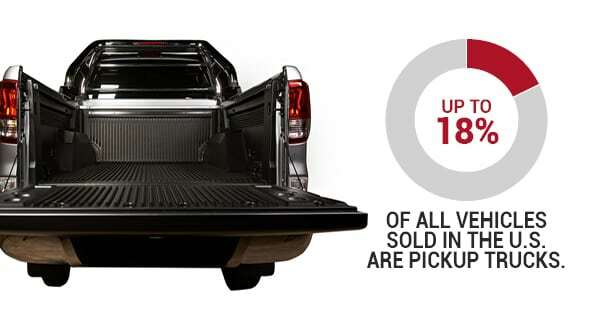 In fact, up to 18% of all vehicles sold in the U.S. are pickup trucks. It’s no surprise why. Pickup trucks have some serious advantages over other American vehicles. Pickups have ample seating, a serious hauling capacity, great cruising comfort, and most of all a truck bed. But are the advantages pickup trucks offer really worth the investment compared to getting an everyday car? When looking for a new vehicle, some drivers will opt to choose a smaller car because they seem more practical. After all, cars are smaller and you don’t always have to lug around some serious cargo. But that’s where pickup trucks have average cars beat. Both pickups and cars can bring you and your family from point A to point B, but only a pickup can help you out when you need to move to a new house, do some serious landscaping, and pack up more than one bike. It’s also a lot safer to pack up everything you need in the back of a truck versus packing things up on the roof your car and hoping for the best. Quality truck bed hooks and straps can keep your gear in place, but the ropes holding your couch to the roof of your car is only so strong. Pickups are a favorite among farmers, ranchers, and contractors because they can carry a lot with comfortable cruising. But you can get a pickup truck whether you’re a rancher or an accountant. Pickup trucks are for those who love to go on trips, do activities, live nomadically, or just like the aesthetic. Whatever your reason for getting one, a pickup truck is a great choice. Where can I find quality truck bed hooks? The average price of a new vehicle is $35,309, but a new vehicle doesn’t always have what you need right off the bat. Quality truck bed hooks can keep your new truck’s cargo safe and secure whether you’re driving off-road or on the pavement. BullRing offers truck tie down straps and truck bed truck tie down anchors to really get your new vehicle ready for the road. To learn more about our pickup truck tie downs, contact BullRing today.